At first I searched the internet for pictures and found different models. Afterwards, I sketched the correct proportions with Google Sketch up. However, I did not do any detailed planning. With the rough plan in mind and the approximate dimensions, we went to the workshop. Oak remains were quickly found (after not much wood for a wheel rises). Since the wheels should not be made of wood, I bought them at the local hardware store. First, as always, the oak pieces were planed to thickness and then cut to size. Since the entire impeller should look ergonomic, I decided to round off all the corners. The trickiest part was certainly the axis of rotation between frame and fork. With a ramp molds and a long screw, however, a very practical solution was quickly found (see picture above). 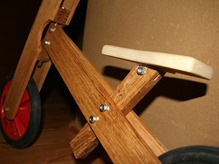 The steering was realized with a round stick made of beech. The wheels were simply fixed with two 8 mm wooden round rods. 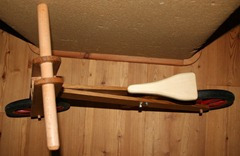 Another challenge was the saddle, which I also wanted to make out of wood. 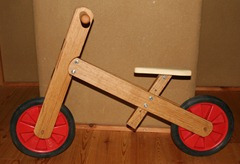 Therefore, I glued several 3 mm birch plywood boards and then cut out the rough shape of the saddle with the band saw. The fine work was then done with rasp and grinding cylinder.